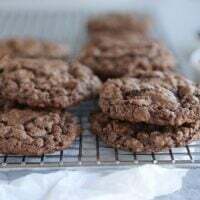 Classic oatmeal chocolate chip cookies have been begging to go 100% chocolate and these double chocolate oatmeal chocolate chip cookies are the answer. Yum! To celebrate that I’m actually following through with the recipe, to celebrate (??) that school’s almost out for the summer, to celebrate the end of the rock pile in our driveway, to celebrate that my kids finally learned how to accurately sort the laundry, and mostly, to celebrate that these truly are some of the best cookies in the universe. 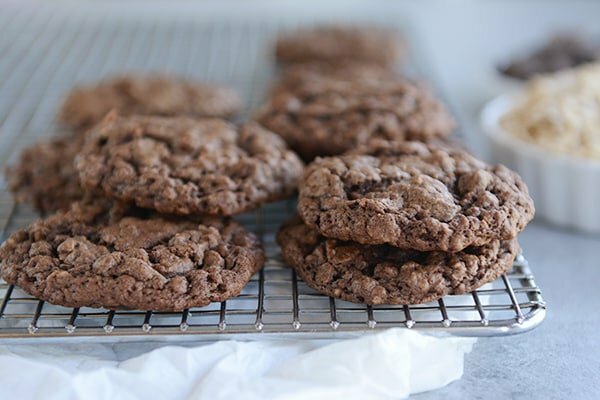 I texted my cousin, Tami, the recipe for these chocolate oatmeal chocolate chip cookies last week and she whole-heartedly agreed with me, so you don’t even have to take just my word for it. Plus, she made them dairy- and egg-free for her daughter, so check the notes of the recipe for those adjustments. My virtual friend, Karen, who sent me the recipe in the first place waxed so poetic about them in her email, I think I was in the kitchen making them within 12 minutes of reading her note. I’ve since made them four times. And I have a stash in the freezer, because, yes, I know firsthand that they are divine straight out of the freezer. 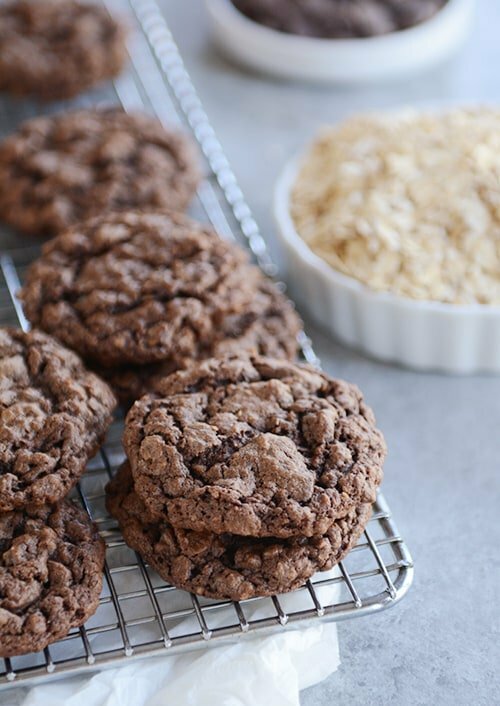 These chocolate oatmeal chocolate chip cookies are incredible. Soft, chewy, ultra-chocolatey. I’m thinking classic oatmeal chocolate chip cookies were meant to be chocolate all the way through. Celebrate something (anything!) and make these today. You won’t regret it. Preheat oven to 350 degrees F. Line two large, rimmed baking sheets (11X17-inches or so) with parchment paper. In a large bowl with a handheld electric mixer or in the bowl of a stand mixer fitted with the paddle attachment, whip together the butter, brown sugar, and granulated sugar until light and fluffy, 1-2 minutes. Add the vanilla and eggs and beat until creamy and light in color, 2-3 minutes. Drop the batter by heaping tablespoon-sized scoops (I use my #40 medium cookie scoop) about 2 inches apart. Bake for 10-11 minutes until the edges are just set but the middles are still soft. Transfer to a cooling rack to cool completely. Repeat scooping and baking with remaining cookie dough. Let's talk substitutions: I found I liked the texture of the cookies best using half old-fashioned oats and half quick oats as noted in the ingredient list; the original recipe uses all old-fashioned oats so you might try it that way (too spready for me). I think using all quick oats may make a super puffy cookie but again, feel free to experiment. Karen, who sent me the recipe, says she uses 100% white whole wheat flour and coconut sugar so there is that, if you are interested. AND, one more - my cousin Tami has a dairy-free, egg-free allergy and she made these with coconut oil in place of the butter, dairy free chocolate chips (the Kirkland chocolate chips from Costco in the white bag), and an egg substitution of...wait for it...just 3 tablespoons water (there's a long explanation why - she sometimes uses a flaxmeal sub or an oil + water + baking powder sub but for this recipe all she needed to do was nix the eggs and add enough water to make the dough no longer crumbly, thanks to the oats, which often make cookies egg-free friendly). Keep in mind she lives at high altitude so your results may vary, but she declared them the best cookies ever which is pretty awesome. Phew! That's a lot of notes for a super simple cookie recipe. Just make them already, ok? I make these and use all old fashioned oats. I like mine thicker. Also, as soon as they come out of the oven I use a salt grinder and top them with some salt. They are divine. My best cookie I have ever made. Everyone raves over them and they are so simple. I also use special dark cocoa powder and mix semi sweet morsels and chunk pieces to increase the goo inside. Enjoy these wonderful cookies. These are SO good and the texture is perfect. I used cinnamon chips instead of chocolate and added a pinch of cinnamon to the dough. Made these today and they are a keeper. Even froze balls of dough to bake fresh another day. Thanks Mel! These are so good my kids & daycare littles loved them. I made these with the dairy free notes for a mom who can’t eat dairy while nursing. They were delicious! I will probably make them this way going forward just because. One of my sons said they were the “most awesomest” cookies ever. The mom loved them. Oh my gosh, these were SO good! Even if the friends with whom I shared them hadn’t said the recipe was a keeper I’d still keep it! I have a feeling these are going to be my g-to cookies from now on. I’m pretty sure I can call them healthy since they have oatmeal in them…. These are terrific! Definitely sweet and definitely chocolatey. I used all old fashioned oats and didn’t have a problem with spreading but I bake all my cookies on parchment paper and I think that helps. I loved these cookies! I totally needed a chocolate fix tonight and these did the trick. I managed to save some to hide in the freezer for when I need my fix later. 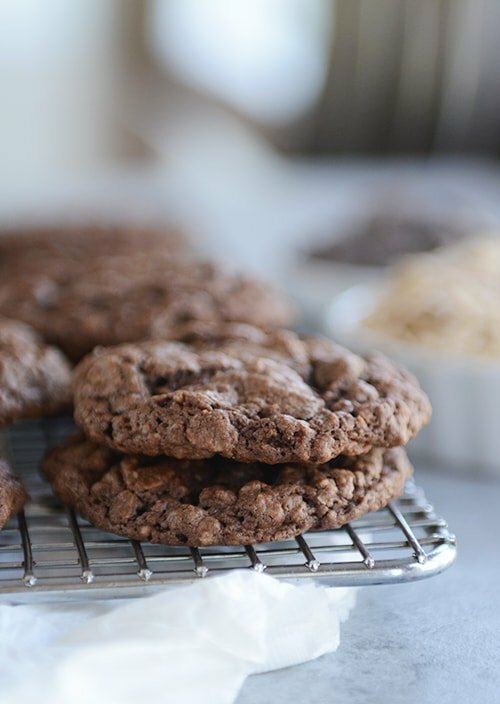 I love finding new cookie recipes and am loving your entire site! I didn’t have quick oats so grinded some in my coffee grinder. The cookies were delicious…a big hit with all 5 of my kids. We are loving these! Fantastic chocolate flavor, and I love the chewiness from the oats. This recipe is definitely a keeper. I love these cookies so much, Grace – so happy you and your fam did, too! do you think I could use all quick oats in place of the old fashioned oats? You probably could experiment – oftentimes the cookies won’t spread quite as much using all quick oats so keep that in mind. I’m also pretty sure others in the comment thread have checked back in with their experience using all quick oats. This recipe was NOT good. Please adjust it- I followed word for word and they were flat and crumbled. Waste! Seriously THE BEST. ever. FYI I also have cut the recipe in half and pressed into one giant cookie. Works great, and I have to share with my family and I don’t end up eating too many cookies! My daughter’s favourite cookies bar none. I am doubling the batch today to stock up the freezer for back to school (next week). This is my go to blog for EVERYTHING!! Thank you Mel. Not sure what I did but these were awful. They stuck to my silpat liners, stuck to the spatula, stuck to the cooling racks. They required much longer baking time and they were still ridiculously hard to take off the pan. I can’t figure it out because the wet to dry was similar to my regular chocolate chip cookie , plus the added oatmeal and cocoa, so they shouldn’t have been so wet. Sorry but this one is not a keeper for us. First time. I made these today and they turned out great…. very delicious! Made these last weekend and they are very tasty!!! This recipe is almost identical to a Quakers/Nestle recipe “Oatmeal Cocoa Chippers” and it has been my favorite for close to 35 years. The minute I saw the picture I grabbed my recipe to compare the two. What a great way to celebrate! So I just made these, and I think I’ve found my new favourite cookie recipe! Thanks. These are soo yummy! We broke a few up and ate them with strawberries and cream. DELICIOUS! Made these today. Amazing! Thanks for the recipe, Mel! I baked these last night and they are awesome! I had just about given up on Pinterest recipes (so many I tried were pretty to look at but bland to eat) when I read a review of your blog on Janssen’s Everyday Reading. She sings your praises and says your food is delicious and boy, is she right! I can’t wait to try one of your dinners. Just took a batch of these to of the oven. I made the dough yesterday, scooped it into balls and let them sit overnight. I substituted 1/2 cup of coconut oil for 1/2 cup of the butter…seemed to work just fine. I also added a 1/2 tea. of espresso powder to amp up the chocolate flavor. Next up…a cookie with my morning tea! Good morning from MD – just wanted to let others (and you) know that I made these gluten free (in addition to dairy free AND egg free, we have LOTS of allergies in our household) and they were DELICIOUS. I used King Arthur multi purpose GF flour and I did use 1 T flax meal + 3 T water for the eggs. Thanks for the recipe and the notes on the modifications. I don’t know why I never thought to do CHOCOLATE oatmeal cookies. Freakin genius. Can’t wait to try these!! HI Mel! Could I possibly halve the recipe?? Would it be just as good? Sure, it should halve just fine. I was just thinking of oatmeal cookies, these are perfect! Thanks Mel and friends! Oh.my.gosh! I’m Internet famous AND you called me your friend…excuse me while I swoon. 😉 Yes, I’m slightly obsessed with your blog, you taught me to cook after all. Best day ever!!!!!!!! The cookies are soooo good even after I healthied them up. Mel! I was so excited when my husband bought me a scale. I’ll have to give these cookies another try. Next time, if I think it looks like too much I’ll measure as well. Ohh boy… these look so so good. I love chocolate and oatmeal! Yummy! So glad you’re enjoying the cookies! These are indeed one of our family favorites … and am so glad to see them so loved by your readers. Love all the tweaks, too! I actually love all the little notes! I love that you can make them with coconut sugar! Laura! I’m so sorry, especially because I’m such a proponent of weight ingredients and then I go and give you the wrong amount. Ugh! I’m sorry! I wish I could bring you a fresh batch of perfect batter and exchange you for the overfloured one. You have 1 1/4 cups flour weighing 11.25 oz. So should the recipe call for 2 1/4 cups or 6.25 ounces? Thanks for the catch, Nancy! It’s 1 1/4 cups flour (so I changed the weight to 6.25 ounces). Sorry about that! These look amazing! Does it matter if Dutch processed cocoa is used here, or does this one work better with natural cocoa? Because the recipe calls for both baking powder and baking soda, I think either could be used (haven’t tried it with Dutch process though myself). So, is it 3 T of water per egg, so 6 total, or just 3 T of water for the whole recipe? If I can also make them gluten free, my husband would be very happy. I just used about 3 TB water total. Enough for the dough to go from being crumbly to held together. Making these now! I think they would be fabulous with peanut butter chips too! But I am making them for my daughters class and there is a student with a peanut allergy so peanut butter chips will have to wait till next time! Love your recipes! I know I can always count on them to turn out delicious! These look amazing! I even have everything to make them in the pantry! Do you think I could briefly process (in vitamix) one cup of old-fashioned oats to mimic quick oats? I usually only have old-fashioned oats on hand. Thanks!! I mixed in my food processor. Did the wet ingredients, then added 2 cups old-fashioned oats and pulsed a few times to make smaller pieces. Turned out yummy! Holy moly these are delicious!!!! Patting myself on the back for doubling the recipe, though I may regret that decision when my pants no longer fit!! 🙂 thanks for yet another winner!!!!!! I came to your site today to look for a cookie recipe to make for family night. Done. Thank you!